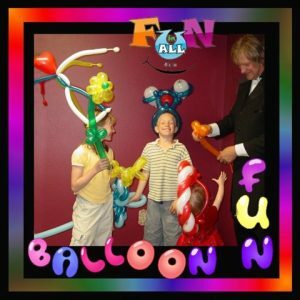 Hire a balloon artist in Salt Lake City to dazzle the crowd. All of our balloon artists will arrive in costume, either as a clown or in a fun party costume, you choose. Balloons are also offered in most other shows. 2 hour specials on our award winning balloon artistry! Balloon artist for 2 hours at 165.00 OR balloon artist AND face painting for 2 hours at 175.00. Have a favorite princess come for 2 hours and paint faces, pose for pictures and bring balloons for 300.00.